Dental implants are modern marvels. 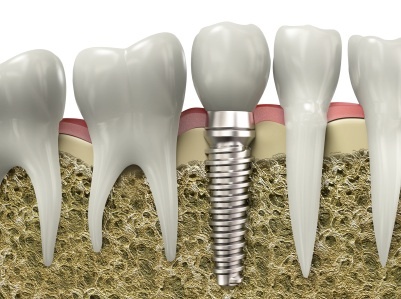 A dental implant replaces a missing tooth root by attaching a titanium post into the patient’s jaw. Supporting material, including an artificial tooth, goes on top of the post. 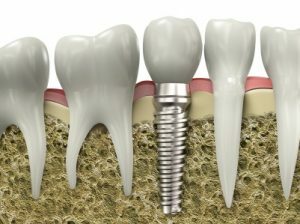 When it’s done, the implant has the look and functionality of a natural tooth. With nearly seventy percent of American adults missing at least one of their teeth, dental implants are the answer to thousands of prayers. But anchoring a device to the jaw is not a new idea. Believe it or not, it goes back more than one thousand years. Archaeologists have unearthed a jaw bone fragment of Mayan origin. This fragment has three tooth-shaped objects, believed to be pieces of shell, inserted into the sockets of missing teeth – very early attempts at dental implants. The jaw fragment have been dated to about 600 AD. We don’t even want to think about how they performed that surgery! Rest assured, modern dental implant surgery is a far cry from what the Mayans must have done. It is, however, surgery. Depending on the condition of the patient’s mouth, implants are either a one- or two-stage procedure. In a one-stage implant, the titanium post is placed in the jaw, along with a support called an abutment. The artificial tooth is added later on, non-surgically, after the implant and the bone have bonded. In the meantime, a temporary artificial tooth can be worn. The two-stage method involves two surgeries. In this case the titanium implant is placed in the jaw and the incision is then closed. Once the implant has bonded with the jaw, which takes a couple of months, the abutment is added in a second surgery. Together, they are the foundation for the artificial tooth. Dr. Nima Massoomi has practiced oral surgery in the San Francisco Bay Area since 2008. He provides single and multiple dental implants and other procedures from offices in San Francisco and Cupertino. If you have additional questions, please visit our FAQ. Call us at 408-253-6081 to schedule a consultation.